Sidharth Malhotra is everywhere these days! The Bollywood heartthrob who turned 34 yesterday, has a busy schedule with an interesting line-up of projects. When he is not filming, he is headlining fashion shows and show stopping at runways. With a profile like his, why wouldn’t he? In fact, instead of taking an off on his big days, thankfully for us, he walked the ramp for designer Rohit Bal and gave his fans a treat of a lifetime. He did so with the beautiful Diana Penty, in even gorgeous creations and looked regal. 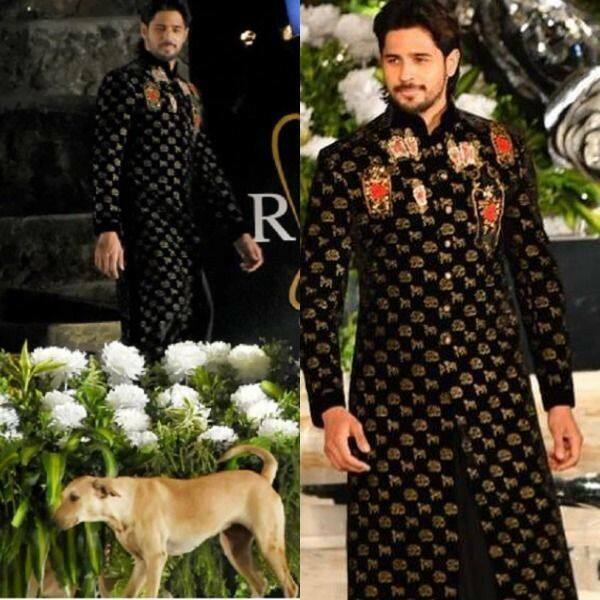 Sid wore a black brocade printed velvet bandgala with floral detailing under a grey manarkali and looked dapper. He walked while Shubha Mudgal crooned Saawariya and that was another spectacle. While that is that, there was another star at the show who kinda sorta stole the thunder from the Ek Villian star. If you’re recalling who you have missed, don’t. Cause you will know in just a video’s time. But since we have to – it was a pawdorable dog who seemingly lost his way and crashed Sid’s walk. No kidding. Watch the hilarious video here. Told ya! On the work front, the actor has his plate full with ventures namely, Milap Zaveri’s Marjaavaan, Jabariya Jodi with Parineti Chopra and the Vikram Batra biopic.